Nature conservation is the priority for the Reserve and due to a range of specific wildlife sensitivities certain restrictions are placed on access and recreational activity. Otherwise it is our vision that the Reserve should be freely experienced, a place where one can picnic, go angling, walking and exploring, and just generally soak up the views, tranquillity and naturalness. Robust and sporting activities are not encouraged as they may be anti-social and any activity (e.g. the use of vehicles, metal detectors, flower picking and up-rooting) that damages and/or disturbs the SSSI and its wildlife is illegal. Guidance on a number of activities is given below, and please see section on ‘Visitor Interests and Accessing the Reserve’. Please also bear in mind that Chesil and the Fleet are private property. You may need permission to carry out your intentions. For further information please contact the Reserve Staff. 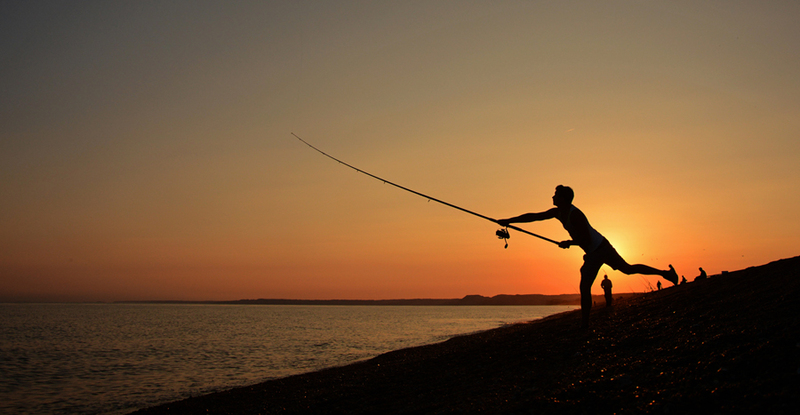 Angling from the outer flank of Chesil is most popular. The beach at Portland, Ferrybridge, Abbotsbury, West Bexington and Cogden is available year round but there is no summer access from Abbotsbury (Tank Teeth to the Portland Boundstone). Angling in the Fleet is not permitted west of the Narrows. In the Narrows and around Ferrybridge angling is permitted but catching bass is formally discouraged (The Fleet is a designated Bass Nursery Area). Please keep your dog’s on a lead or under close control, and avoid the Fleet and intertidal areas which are so important for feeding and roosting geese, ducks and wading birds. There are no dog waste collection points on this extensive reserve. We are happy for dog waste to be left on the shingle as it quickly disappears. Elsewhere please pick up and take home. Camping is not permitted but the use of ‘beach buddies’ by anglers on the seaward side of the beach is. Fires lit directly on the beach are not permitted and dangerous – hot pebbles explode. A raised BBQ is fine. Pebble collecting is not permitted. Despite there being millions of pebbles on the beach they are all required to help the beach act effectively as a sea defence. No more pebbles are coming onto the beach and gradually with sea levels rising and pebbles wearing out we are increasingly at risk of the beach being breached. Not only this but the beach and its pebbles are private property. The digging of bait worms is permitted (not in the mid and West Fleet areas) for personal use only. Holes are to be back-filled and disturbance to birds kept to a minimum please.